Well, Halloween is just two days away and before I know it, kids from all over the neighborhood will be ringing my doorbell to get their yummy treats. These are kids that on any normal day, I’d know in a heartbeat. But in two days, I’ll be squinting my eyes, peering at them carefully, trying to figure out who is who. My daughter (shown above) is a kid who starts planning out the next year’s Halloween costume as soon as Halloween is over. 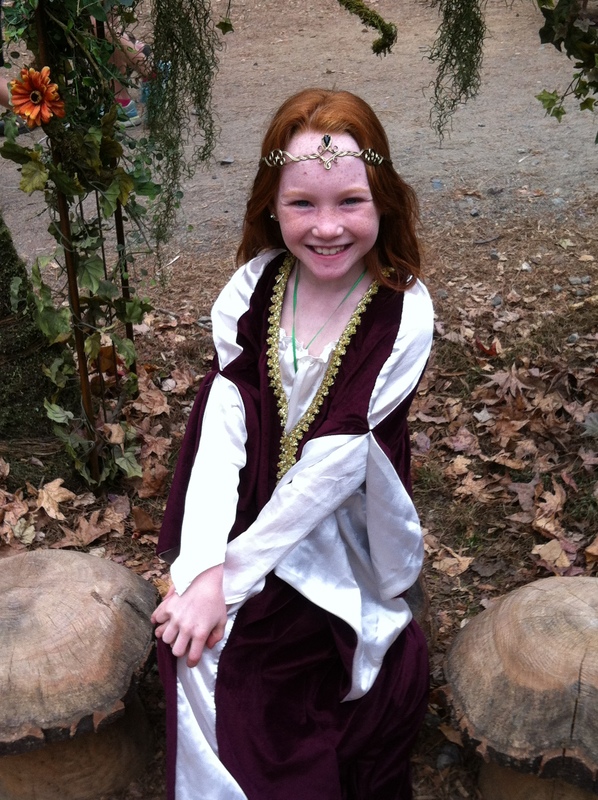 And throughout the year, she and her friends love to play “dress up” and pretend they are someone other than themselves. I have to admit that, when I see her and her friends running around in crazy outfits and costumes, it makes me giggle sometimes. Especially when I see them running around in some of MY clothes and make-up, complete with my high heels. I shake my head, smiling, wondering why in the world they would want to be “adults”. When kids do this, it’s just one of the ways they go about figuring out who they are and what makes them tick. For those of us who already are adults, how often do you take the opportunity to reflect on your life and think about whether or not you are the person you want to be? Whether or not the person you are now is the person you envisioned yourself as being when you were a kid? Last week, I wrote about cultivating your personal harvest so that you can plant the seed for new growth over this next season. So this is the perfect time to discover who you truly are. Reflect on where your life is at this moment, and if you’re not where you want to be, it’s the perfect time to figure out how to get there. Plant a new seed, if that’s what you need in order to grow. Using your time on the mat to help in this discovery process can be just the thing you need. For example, when moving through a challenging vinyasa sequence, do you tackle it with gusto, or do you hesitate and back off? Are you listening to your breath and your body, so that you leave the mat feeling rejuvenated rather than depleted? C’mon tell me who are you, you, you? Autumn is my FAVORITE time of year. In the area of South Carolina where I live, the summers are so hot, humid and sticky…I feel like I’m so lazy and useless during the summer! 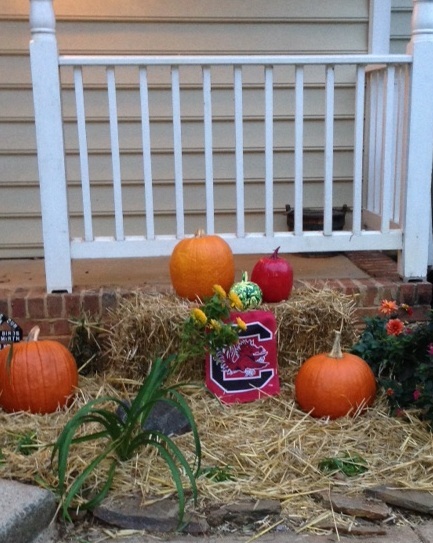 But the fall season brings crisper, cooler weather, which seems to give me a renewed sense of purpose and energy. It seems like every fall, I start taking stock of where I am on my life’s journey, reevaluating if I’m still heading in the direction I think I should be. In terms of yoga, when I do this reevaluation of my journey, I usually find that I’ve slacked off in my practice during the summer months for a variety of reasons. Thankfully, that wasn’t the case for me this summer, and I was actually able to practice MORE than normal. Yay! However, many people get distracted by all the summer holidays and parties, and find they are too busy to fit in their yoga practice. But in the fall, life begins to slow down all around us, and we begin to notice things like the leaves falling from the trees and the animals preparing themselves for the colder days. If you feel you’ve been “too busy” these past few months to notice the life all around you, then use this new season as a time to SLOW DOWN. This is the perfect time to focus on your intentions, as autumn invites us to turn inwards and reinvest in our “personal harvest”, so we can prepare ourselves for yet another season of personal growth. If your life seems like one big “To Do” list, where you’re constantly ticking off one thing and moving on to the next, now is the time to pause and reflect on what you have achieved so far this year. When we’re constantly running from one thing to the next, in a constant state of “busyness”, we don’t take the time to note the things we’ve been able to complete. We don’t take even just a few seconds to do sit back and look at what we’ve accomplished. Use your yoga practice as a way to nurture yourself. Make sure to include not just the poses (asanas), but also breathing exercises and meditation. Bring your yoga outside at this time of year if you can, as yoga is a great way to connect not just with the body, but with all things connected to nature. Incorporating all these elements into your practice can be really helpful if you have a hard time with the concept of slowing down and letting go of the things which do not truly serve you. They can help you to cope better with anything presented to you, leaving you feeling more fulfilled and complete, happy with yourself just as you are. And when you can do this, the growth can continue for another season, helping you to become everything you are meant to be. 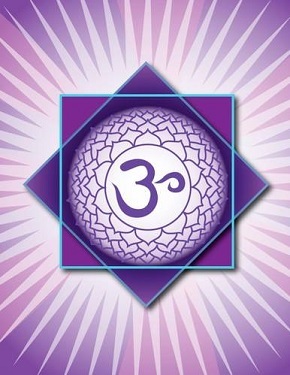 The Sahasrara (Crown) Chakra is the seventh and final Chakra, and is located at the crown of the head. It is associated with divine wisdom and enlightenment, and with being one with the world. It is associated with the color violet or white. Some say its associated element thought, some say it’s cosmic energy. The associated body parts are the brain, the right eye, the pituitary gland and pineal gland. Those who are strong and balanced in this chakra are very wise and are seen as spiritual leaders. They are able to understand and learn new information very easily. They are seen as humanitarians, thoughtful and open-minded. Those who are overactive in this chakra tend to be impractical and not connected to reality. Those who are depleted in this chakra tend to be uninspired, feel misunderstood and are in a constant state of self-denial. They are disconnected with life itself. An imbalance in this chakra, in either direction, is thought to contribute to such issues as Alzheimer’s, depression, dizziness, epilepsy, certain autoimmune disorders (i.e., Multiple Sclerosis), paralysis, certain mental illnesses (i.e., schizophrenia and multiple personality disorder), immune system disorders, nervous system disorders (i.e., Parkinson’s Disease), learning disorders or difficulties, headaches (including migraines), and insomnia. To balance this chakra, it is important to include meditation, as it is wonderful at helping to cleanse a busy mind. Strive to include some meditation every single day…even if you only have time for 5 minutes, it will help. If you can stop the busyness of your mind, and find the silence within, you’ll be AMAZED at how many truths are uncovered for you all of a sudden. I know that for me, since I started incorporating meditation into my own practice regularly, I feel a huge difference. I definitely feel more spiritual, more connected with God, and I feel like I’ve come a long way into figuring out what my purpose in life really is. It’s a very freeing feeling, let me tell you! From a physical standpoint, inversions (like Shoulder Stand), Fish Pose and Lotus Pose are great asanas to incorporate into your practice for this chakra. We will be including some of these poses in class this week, so I hope to see you on the mat! The Ajna (Third Eye) Chakra is the sixth Chakra, and is located at the brow, above the base of the nose. It is associated with our ability to see both the inner and outer worlds and is said to be the seat of wisdom, as well as the seat of conscience. 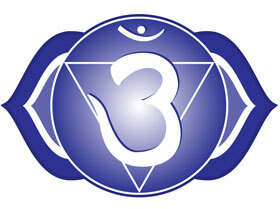 Our ideas, dreams, goals, values and our “self” image all begin in this chakra. It is associated with the color indigo and the element light. The associated body parts are the brain, neurological system, eyes, ears, pituitary gland, and pineal gland. Those who are strong and balanced in this chakra experience high mental ability, are able to separate between reality and imagination, and can easily combine logic and emotion. They experience overall good health, clear thinking and focus. They also have good intuition, are empathetic towards others, and trust themselves. Those who are overactive in this chakra may become delusional and create circumstances in their minds that are not really happening (i.e., a mental illness). They may also tend to be judgmental, unsympathetic or over-intellectual in their thinking. Those who are depleted in this chakra have difficulty in understanding the spiritual side of the world and the connection between their inner and outer reality. They can lack empathy for the people in their life, lack common sense, and/or intuition. Those who are out of balance in this chakra, in either direction, are more prone to such issues as brain tumors, strokes, blindness, deafness, seizures, learning disabilities, spinal dysfunction, panic, depression, migraines, headaches, dizziness, nausea, and equilibrium dysfunction. We will be focusing on the Third Eye Chakra in class this week. To balance this chakra, it is important to include meditation, as this helps develop intuition. Also, any pose where you can use a prop or your hands to press upon and stimulate the third eye area is another way to help bring this chakra into balance.